Matt is going to Vienna. Theodoros has created the deal All inclusive holidays at sovereign beach!!!. 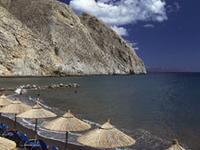 Travelers are voting Perissa as the best recreation / outdoor near Santorini. There are 2 recreation / outdoor in Parikia a city just 139 km from Santorini and 1 recreation / outdoor in Sifnos which is 132 km distant. The most popular of these are Agios Stefanos in Parikia and Golden Beach in Sifnos. You can find 17 recreation / outdoor in South Aegean and 159 recreation / outdoor in the country of Greece. Our members favorite in South Aegean is Santorini and Crete is the top pick in Greece. Want more? Check out our map of recreation / outdoor near Santorini.